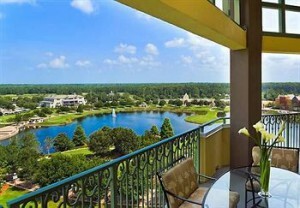 The view from the Renaissance Hotel includes the World Golf Hall of Fame, Slammer and Squire Golf course, and shops. When Hall of Famers rest their heads on your beds, you’ll better be a top class hotel. On Monday, May 6, international golf luminaries Fred Couples, Ken Venturi, Colin Montgomerie and Ken Schofield will spend their first night as “Hall of Famers” at the Renaissance World Golf Village Resort hours after a star-studded, televised ceremony inducting them into the adjacent World Golf Hall of Fame in St. Augustine, FL. Your stay at the Renaissance World Golf Village will be memorable because if you’re not a Hall of Famer, you will feel like one. You needn’t even remove your golf shoes for the entire stay because the recently renovated, 300-room hotel, Hall of Fame, two golf courses, the world’s largest golf shop, and golf-themed restaurants are all intertwined around a small lake just off I-95. The World Golf Hall of Fame is an interactive, creative museum with unforgettable exhibits including Masters jackets, tournament winning clubs and revealing personal items donated by golf’s historic and prolific winners and kept in each player’s “locker.” A morning visit to the Hall of Fame will surely inspire a fine round only a few yards away. Rival Hall of Famers Arnold Palmer and Jack Nicklaus collaborated to design and lend their respective nicknames to the playable and fun “King and Bear” course at World Golf Village, which, like its’ sister course, the “Slammer and Squire,” – named to honor late Hall of Famers Sam Snead and Gene Sarazen – has hosted a Champions Tour event. The courses and resort are part of a collection of First Coast courses available through www.Florida-golf.org, a not-for-profit organization which leads visitors to facilities of distinction such as the beautiful seaside Ocean Course at Hammock Beach Resort, in nearby Palm Coast, also a Nicklaus design.